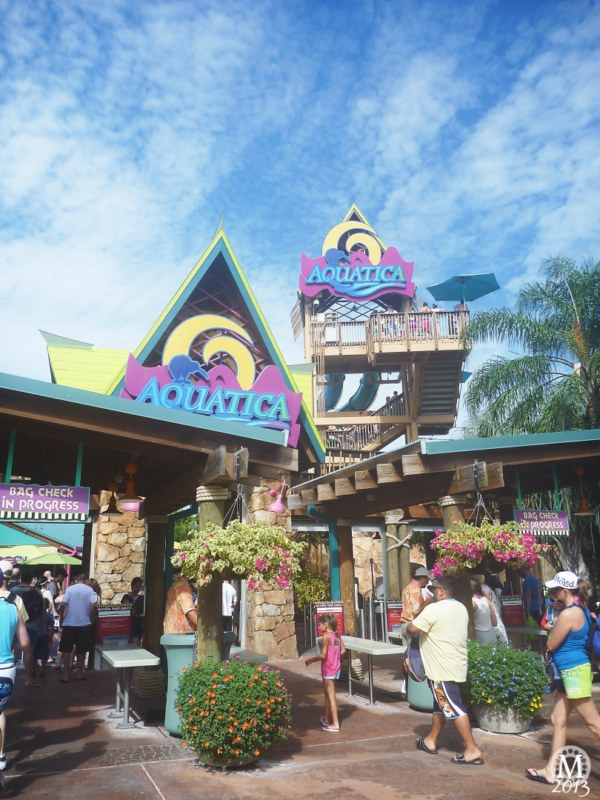 We loved Aquatica on our first visit to Orlando, and we loved it just as much this time! We had a bit of a faff with the tickets scanning and fingerprints, but eventually we were in. On the way to find a spot to stake out for the day we met and petted a lizard. Mustn’t touch his head though! Having been to Aquatica before meant we knew we wanted to be close to the Roa Rapids which is our favourite ride at this waterpark. We found some loungers – we made sure we got there nice and early and dropped towels down to mark our territory. We then went off to get a locker for our valuables. We knew we’d want to buy a wrist band for Banana Beach Cookout enabling us to go around the buffet as many times as we wanted throughout the day. So after putting our stuff in a locker, we went to purchase them. For the three of us it was $53.97. We also bought a refillable cup for $5. With the food bands purchased, we went off to find the life jackets for hubs and the boy to wear whilst going around the rapids. Roa Rapids are like a crazy lazy river, but without the inner tubes. The current pulls you around the course, and when there are a lot of people in there you have to watch out for others as sometimes it’s tricky to stop when the water is dragging you along – but we love it! After a few laps in Roa Rapids, we stopped for lunch and went through the buffet line at Banana Beach Cook Out. It’s standard American fayre – hotdogs, pulled pork, pizza and salad. Nothing fancy, but good food for the money especially as you can help yourself all day long if you want to. There are some sweet things too – pudding, cookies and cake, as well as some fruit. You can also help yourself to drinks. You are not allowed to take anything out of the dining area though. Which is why we bought the refillable mug for $5 so we could take a drink outside with us. After lunch and allowing it to go down, we went into the lazy river which was a nightmare to get an inner tube for – if I recall correctly this was the same before. It’s because they have a slide entrance through the lazy river and all the different floats get mixed up. We only went around once because, compared with Roa Rapids, the lazy river is a snooze fest – so much so, I don’t seem to have a single photo of us on it! As the day went on, it got quite busy in the park and sadly we encountered quite a few pig ignorant Brits. Not directly, but you could hear what people were saying and see how they were behaving – I was quite embarrassed to be British. …in fact, we were pulled out of the water several times that day due to the threat of thunderstorms – rather be safe than sorry, so we quite happily sat under our beach umbrella until we were allowed back into the water. At one point, because we were literally on the edge of the entrance to Roa Rapids, we were the only people in there for a while, which was fab! Although, it wasn’t long before it filled out again! Most of our day was taken up with being in the rapids – you may think that to be quite boring, but with big queues on the slides, we were all quite happy in there! Liam and Steve did attempt to go on some slides, but just couldn’t be bothered to wait. I’d say that the key to a waterpark is get there early and get on the big slides you want to go on first and then, just be prepared to wait! By late afternoon, when the weather had turned to rain with it not looking likely to clear up, we decided to make the move back to the villa. Oops, nearly forgot we saw an African spurred tortoise – he was a right speedy guy! Back at home we got showered and dressed and decided what to do for dinner that evening. BBQ was the choice from the boys and we drove down Hwy 192 to Wildside BBQ Bar & Fire Grill. A day in a waterpark, doing not very much is more tiring that you realise lol, so we didn’t want to go to far, but also wanted to try a different BBQ place after trying Sonny’s Real Pit BBQ on our first visit. The restaurant was fairly busy, but we were shown to a table on the other side of the restaurant that was a little quieter. A rather eclectic mix of artwork on the walls with murals painted directly on them, including this one of Aerosmith’s Steve Tyler. We were given menus and some suggestions as to what to try out. We decided to give the gator bites a go. I’ve had alligator before – it tastes like chicken – and the boys were up for trying them. Liam took a photo to share with his friends on Facebook and played “guess the food”! I don’t seem to have made a note of what we had, but to me it looks like BBQ platters and some sides. The food was okay, nothing special, and the service was a bit on the slow side. The bill came to $53.43. We probably wouldn’t go back!